NEW DELHI, India (CNN) -- Indian police arrested two suspected dealers in black market cell phone chips -- a vendor and a Srinigar police officer -- in the effort to trace how the Mumbai attackers got theirs. 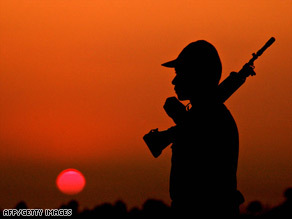 An Indian Border Security Force soldier patrols Agartala Airport, Tripura, which is on high alert. Investigators are also taking a closer look at an Indian citizen who was arrested in February with maps and drawings of some of the Mumbai locations attacked last month. The vendor was arrested in Calcutta; the police officer was arrested in Delhi. Indian officials have said the November 26 attacks that killed 179 people in Mumbai were carried out by outsiders, but these developments suggest that investigators are also looking for homegrown terrorist connections. Indian authorities believe that all the attackers were Pakistanis, specifically blaming Lashkar-e-Tayyiba, an Islamic militant group based in Pakistan but also active in Srinigar, the capital of Indian-controlled Kashmir. The group, known as LeT, has denied any responsibility for the attacks, but the sole surviving gunman told interrogators he was trained by LeT, Indian authorities have said. Pakistani authorities deny that the attackers were from their country, instead blaming what they call "non-state" actors. An analyst who studies India-Pakistan tensions believes that this operation was planned and carried out by militants from Bangladesh, Pakistan -- and India. "They needed people on the ground who could guide them and provided the inside dope," said Shuja Nawaz, author of "Crossed Swords," which examines the role of the Pakistani army and that nation's relations with India and the United States. "Otherwise, the Lashkar doesn't have the capacity to have cased the joints, to have made all these plans and get these people into the target area so effectively." The two men arrested on charges of illegally purchasing cell phone SIM cards, using fake identity papers, will be questioned by police who want to know whether they sold cards used by the Mumbai gunmen, according to Calcutta Deputy Police Commissioner Jawad Shamim. SIM cards -- subscriber identity modules -- are portable memory chips that make it easy to switch cell phones. Intelligence experts say they're used by terrorists to throw their pursuers off the trail. Though Shamim suggested that reporters should not jump to any conclusions about a connection, he acknowledged there were unconfirmed suspicions that one of the slain gunmen carried a mobile phone card activated in Calcutta. "It's now up to the Mumbai police to investigate," Shamim said. Indian security sources told CNN sister network CNN-IBN on Thursday that a Bangladeshi national bought cell phone SIM cards for the attackers at several locations inside India. An Indian man was arrested along with five foreigners in north India in February with sketches and maps of Mumbai locations that included several of those attacked last month. Faheem Ahmed Ansari, an Indian citizen who carried a fake Pakistani passport, sits in an Indian jail awaiting trial on charges of planning a suicide attack on Mumbai's stock market and the Churchgate railway station. At the time of their arrest 10 months ago, Amitabh Yash, senior superintendent of police in the state of Uttar Pradesh, called the arrest of the six men "very significant." "Generally, we catch two or three of them; the rest manage to escape," he said. "But then, this is also a warning because that tells us how extensive the network is," Yash said. "And you can be sure there will be others." Indian security officials have been heavily criticized since last month's attacks on Mumbai for not heeding the warning signs.